Elizabeth Lee examines ice formations as she heads south into Bulwagga Bay for a skate. Photo by Kevin Boyle. On December 19, 2018, LCC member Elizabeth Lee and four friends donned their cross country ski boots even though there was no snow on the ground. There was, however, ice -- wild ice that forms naturally on Lake Champlain. A cold few weeks had frozen some of the southern bays and the river-like strip of the South Lake, so Elizabeth and pals stepped onto Nordic skates and headed to Crown Point in the early morning light. By the end of the day they had skated more than thirty miles, taking in the sights from Monitor Bay to Ticonderoga and up East Creek until it became a trickle under a thin shell of ice. The journey included a quick portage over a point of land where the ice looked unsafe. Tired but satisfied, the friends bonded over a nice picnic – thanks to a friendly landowner who let them shelter from the wind near the Ticonderoga ferry. Dan Spada, John Rosenthal and Elizabeth Lee (left to right) glide across the frozen lake on their Nordic skates. Photo by Kevin Boyle. Elizabeth lives in Westport, is a New York State outdoor guide and Education Director at the Lake Champlain Maritime Museum. Water has always been a fundamental part of her identity. She began her career as a scientist with an experiment on freshwater mussels at the age of six, and has never stopped taking in the big and small wonders of the lake, its rivers, and its brooks. In the summer she paddles across the lake to the Museum’s lakeside headquarters in Ferrisburgh as often as her schedule (and the weather) allows, but skating to work in the winter has eluded her. The ice conditions just haven’t aligned with other factors, although she was finally able to ski to work earlier this month. When asked about her adventures on the ice, Elizabeth said, “My 30 mile birthday skate is probably the highlight of my skating life—it was the perfect combination of my need for a big adventure, a day off from work, friends who wanted to go, and lake conditions that made it possible.” She first learned about Nordic skating in 2014, from friends who had been doing it for a few years. There was a growing group of skaters in Vermont looking to expand their network, and Elizabeth jumped right in. She credits skating partners Kevin Boyle, John Rosenthal and Dan Spada with helping her build her skills in a safe, fun environment. Nordic skating is a specialized version of ice skating the comes from Sweden, where people skate on the Baltic Sea. Nordic skates clip onto Nordic ski boots, and are so sharp they’ve been compared to kitchen knives. This sharpness allows skaters to glide effortlessly across the clear ice. When the ice is thin the Nordic skates produce a cold, clear sound that seems to resonate in the ice itself, similar to running your finger along the rim of a glass cup. A group of Nordic skaters get ready for an excursion across the cold, hard ice. Photo by Vincent Rossano. For those who have grown up ice skating, transitioning to Nordic skates is fairly straightforward. Youtube videos and pointers from friends can fill in most knowledge gaps. Search your area for local groups and equipment rental stores, both of which can provide an easy way to try the sport out, stay up-to-date on ice conditions, and even get lessons on technique. Nordic blades clip onto Nordic ski boots, giving skaters a simple transition between winter sports. Photo by Vincent Rossano. The only gear that’s specialized for Nordic skating are the blades, which are designed to clip onto Nordic ski boots. These blades can be pricey, costing roughly $120-180 new depending on the brand and length. If you are unsure about making that commitment, it may be a good idea to rent or borrow a pair before purchasing. The rest of the gear revolves around safety. “I follow the All-the-gear-all-the-time (ATGATT) plan” says Elizabeth. “When I skate I use a helmet, a personal flotation device (PFD), ice picks that hang around my neck, a throw line, and knee and elbow pads. I also use ice test poles to check the ice thickness—they are like ski poles but much harder.” Nordic skating poles are specialized to punch through the ice to test its depth, as well as to help propel the skater over the ice. Ski poles are not designed to do this, and run the risk of breaking if you try. When choosing your clothing it is important to plan for wind and cold. Many Nordic skaters wear wetsuits or drysuits, which help them keep warm if they fall through the ice. As always with winter sports, you should dress in loose layers to trap warm pockets of air around your body. Choose fabric that will stay warm even when wet, like wool, fleece, or polyester. Consider wearing goggles, sunscreen, and a face mask to protect against the sun and wind. Nordic skaters should also carry a dry bag with them (similar to the day pack carried by hikers) containing basic survival supplies: an extra set of warm layers, water, snacks, a first aid kit, a throw rope, a charged cell phone in a mini-dry bag, and a compass in case of white-out conditions. Nordic skaters flock to clear, snowless sections of lake ice that are easy to glide across. Photo by Vincent Rossano. 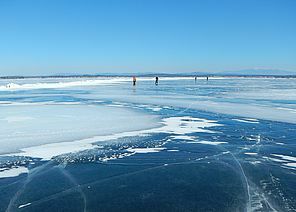 Lake Champlain is a prime spot for Nordic skating. Its vast expanses of water can form large, unbroken plates of ice under the right conditions. The numerous boat launches and other public access sites then allow skaters to easily get out on the ice. 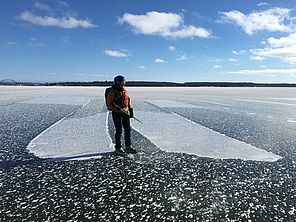 Lake Champlain is home to many local groups of Nordic skaters (and other winter recreation enthusiasts) who keep tabs on ice conditions on the lake. 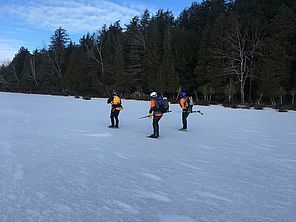 Champlain watershed local Bob Dill’s website, Lake Ice, is also a great resource for current conditions on the lake, as well as ice information in general. Burlington's Waterfront Park, Malletts Bay in Colchester, and Sand Bar State Park in Milton are all popular launching points on the Vermont side of the lake. New York sites include Northwest Bay and Bulwagga Bay. Further inland, John Dimon (owner of the Human Power Planet Earth bike shop) is known to host demonstration days when people can try Nordic skates in the Saranac Lake area. 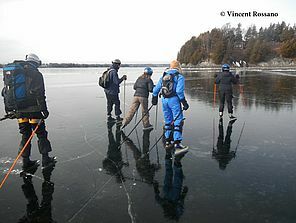 Wherever you choose to go on Lake Champlain, black ice is the best for Nordic skating. However, “You have to catch it when it happens. The location of conditions is entirely dependent on the mix of temperature and wind, and the sequence of changes,” notes Elizabeth. 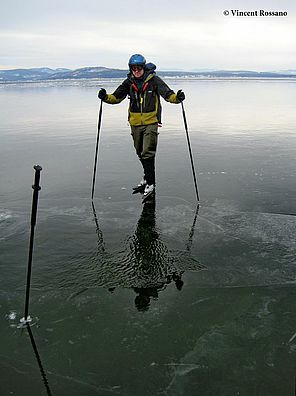 Luckily for those hoping to try Nordic skating, Lake Champlain is filled with possibility. Large swaths of ice, long winter months, and an enthusiastic skating community are part of what makes this lake special.